Linear, dsDNA genome of about 2,473kb that encodes potentially for 2556 ORFs. NUCLEO-CYTOPLASMIC Replication cycle lasts 10-15 hours. 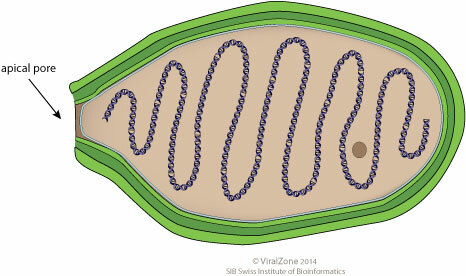 Fusion of viral envelope with cellular membrane at virion apical pore, inducing the release of viral DNA into host cytoplasm. ETYMOLOGY Pandora: from Greek pandora “gift”, referring to unexpected discovery of this virus. GEOGRAPHY Pandoravirus salinus was isolated in Chile, Pandoravirus dulcis in Australia.